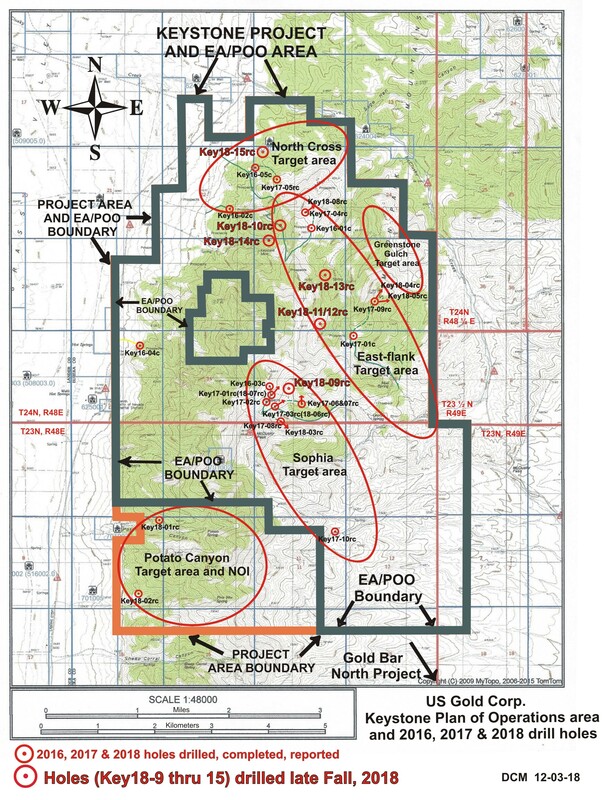 U.S. Gold Corp.'s Autumn 2018, target-specific, drilling program is approaching completion at its 20 square mile, Keystone project, in Nevada's Cortez Trend. The program has consisted of 6 reverse circulation drill holes, totaling approximately 10,000 feet (approx. 3,500m), and is testing several drill targets in areas previously inaccessible with a drill because of permitting limitations. Identification and qualification of these targets has been in progress since the onset of the exploration program almost 3 years ago. 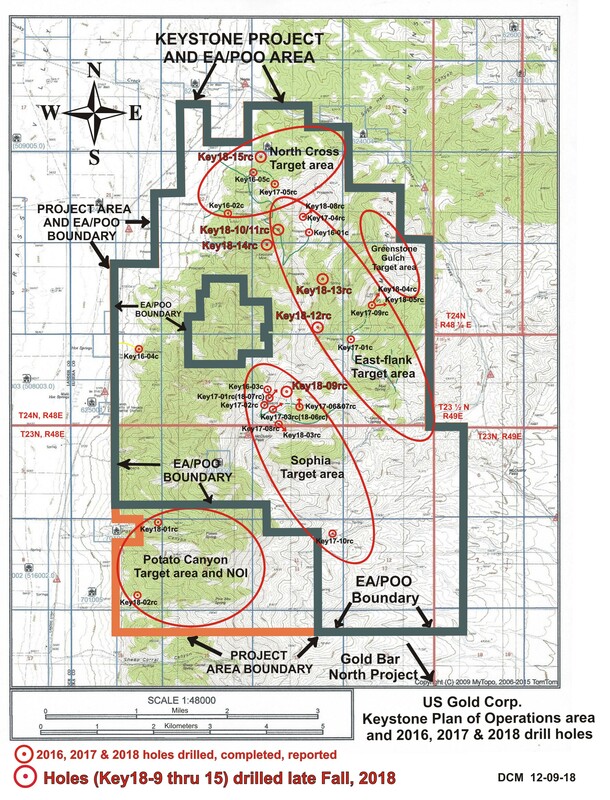 This targeting effort has included iterative detailed gravity surveys, detailed geological mapping and associated prospecting, rock sampling and detailed gridded soil surveys, in addition to prior scout hole drilling. 2016-2018 scout-type drill holes, comprised of 22 individual holes drilled from 15 total drill sites, have importantly added to the knowledge of, and geological understandings of the permissive lithologies and favorable stratigraphy of the project. Scout drilling has also encountered thick sections of permissive rock, including Horse Canyon, Wenban, and Roberts Mountains Formations (similar host rock packages to the sizeable deposits at the north of the Cortez Trend), hosting anomalous to multiple gram gold intervals associated with very anomalous and thick intervals of pathfinder metals. The Autumn 2018 drilling program will now provide a first test to some of the most compelling targets on the Keystone project.